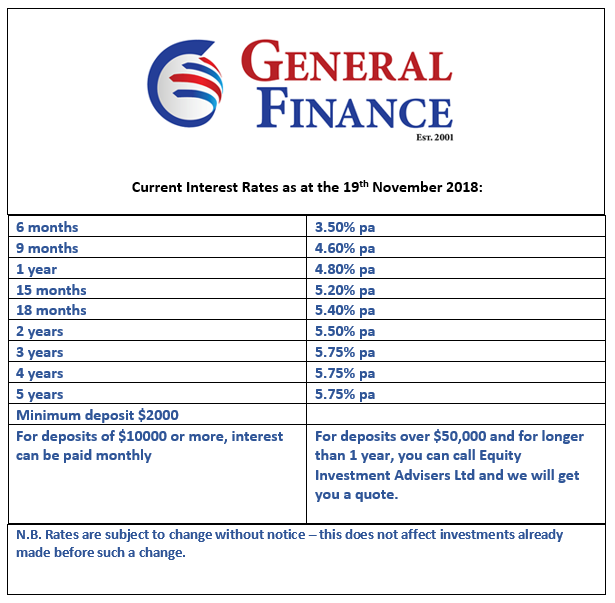 General Finance are offering attractive interest rates on their secured term deposits, especially when you consider these in the light of some very long-term bonds and notes (5 years or more) that have been offered in recent times at 5.1% or less per annum. Below is a table of General Finance’s latest secured term deposit rates. Below is a link, which you can click on and access the PDS (Product Disclosure Statement), which contains pertinent information about General Finance, that investors need to read and consider before deciding to invest. Registering your interest does not have any obligation to invest. No money is sought at this point. Before you decide to invest, you MUST read the PDS, so that you may have a better understanding of the investment product, its risks, as well as its benefits.